I watched this video 2 or so years ago (I love viruses) and thought that it really connects to our recent unit and the idea of vaccination against disease without consent and the medical experimentation on a readily available – unprivileged – population. In short, the documentary links the production and research of the second wave poliomyelitis vaccine (after a lot of the original Salk vaccine was found to be faulty) in the 1950s, and the competition between two doctors to create a new effective vaccine, one of whom is the man considered the pioneer of the fight against polio, Dr Hilary Koprowski, who allegedly tested and developed the vaccine in monkey tissue cells and potentially used chimpanzee kidney cells. The ostensible use of the latter, as argued by the movie, is linked to the emergence of AIDS and the isolation of the first ever seropositive HIV sample, coming from Leopoldville (contemporary Kinshasa). I believe that the connection to the living laboratories issues that the movie points out is the following: the Oral Polio Vaccine developed by Koprowski was delivered to 1 million citizens of the Belgian Congo, as it had to be tested before delivery into the US. This was problematic as 90 million Americans have already been vaccinated with the original Salk vaccine, so a ‘’fresh’’ population was needed. 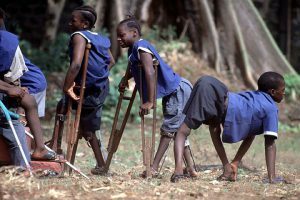 Eventually, the Belgian Congo government forced its citizens to undergo polio vaccination, as refusal to do so was illegal. Soon after the end of the campaign, the first cases of HIV-infected patients emerged, so that after the Rolling Stone published an article claiming Koprowski’s involvement into the emergence of HIV but later apologized to Koprowski due to a certain mistake that disproved their argument – the correct species infected by SIV.As some answers were missing, journalist Edward Hooper started researching the link between the polio vaccination campaign and the potential use of chimpanzee cells for growing the vaccine (chimpanzees are infected by HIV-1 cousin virus, SIV, standing for simian immunodeficiency virus, so that it could have mutated into HIV, as human and chimpanzee genomes are 98-99% identical, creating potential zoonosis; SIV does not infect green macaque monkeys who are routinely used as sources of cells, hence the error of the Rolling Stone) and the first seropositive HIV samples. He found witnesses in the Camp Lindi Laboratory in Stanleyville (where the vaccine was developed) whose testimonies were in favor of the fact that chimpanzee tissues were harvested for growing the vaccine. I find the connection to our class in the way people were subjected to a subtle kind of experimentation: being vaccinated with lots that might have been contaminated with potentially deadly germs without checking for any issues of liability, namely contaminating people with a disease which ended up infecting more than 70 million people worldwide, of whom 35 million died by the end of 2015. In a way, this documentary is a continuation to our class experience from the times of Medical Apartheid, with translating results from the immunization in Africa to the subsequent immunization in the United States, and with our current unit, as the sanctuary of the body was forever ‘’branded’’ with disease, and what is worse is that this is ‘’a disease of young people’’, as pathologist Dr Cecil Fox points out in the movie. 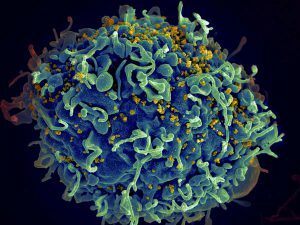 This would mean that there is an ongoing legacy of scientific racism, as HIV is prenatally and sexually transmitted. I think that we should pose the question whether the rush to find a novel vaccine to cure a terrific disease like polio (which in the 1950s killed and paralyzed 500, 000 people annually) should be justifiable as it might have caused the health crisis of the 21st century and left the continent of Africa devastated, and what is the ‘’lesser evil’’ when it comes to medicine: is it instantaneous dwindling of mortality rates of poliomyelitis (which today is almost eradicated), or is it the ongoing agency of infecting, killing and economically demolishing, and socially stigmatizing whole continents with AIDS?